As a mom of three teen boys, I can honestly say I have tried about everything under the sun to earn enough income to work from home and be able to stay home with my kids. I went from a corporate job at General Electric to running a daycare center out of my home, working numerous jobs from home, many with crazy late night hours to selling items on ebay auctions and in an ebay store. What I found was that I worked very hard to stay home with my kids. I did not regret it, not for one minute, but I will be honest, it was hard work working from home and taking care of the kids. My kids are all teenagers now and even though they don’t require the kind of attention they needed as toddlers, they require my attention just the same. I am blessed with three teen boys that I adore and I can remember the days I was not sure I could ever have children due to infertility issues. I am thankful everyday that I was able to have these wonderful gifts from God. They are gifts, but they can be quite expensive gifts just the same. And, that makes it more important than ever to find a way to earn money working from home while raising a family. Yes, there are opportunities to work from home. But, honestly, working from home in the current economy has been a little more difficult. In the past, it was easier to find jobs where you could telecommute. The internet has made work from home jobs easier to come by. When the economy changed, it made things harder. Now you really need a relationship with the company and a level of trust. There are more people looking for jobs these days so companies are not as anxious to give out concessions like working from home. So what is a Stay at home Mom or Stay at home Dad to do? I learned something a few years back that has changed my life. First off I determined that working from home was the lifestyle I wanted. I want the opportunity to be there for my kids, to be involved in their lives, be home when they need me, have time for family vacations and movie nights and all those things my hubby & I have determined are important for our family. So I had to find an opportunity that met those goals. I decided that a debt free network marketing company with a unique product that helped people was the opportunity I was looking for. Something unique was very important as I did not want to worry about pricing wars on similar products. I learned that the hard way with Ebay. I was introduced to XO Healthy Chocolate, a cold pressed dark chocolate without all the waxes and fillers that you see in traditional chocolate candy. I had been reading about the health benefits of dark chocolate for quite a while. The fact that this company has a unique product and is the only one I know of who cold presses their chocolate and does not heat or dutch it like traditional chocolate also interested me. Medicine as one of the best diets. I know the meal replacement shake works firsthand. I lost 64 pounds so far on the shake!! Once I realized that this company, Well Beyond who makes the XO Healthy Chocolate had the highest antioxidant product on the planet, that I could find anyway, I knew I had hit a goldmine. The potential is there and that excited me. I made the decision then and there that I wanted to get involved as a Business Builder and got to work with the company. It was so easy. I paid $39 to join which gave me a website and a back office and then all I had to do was purchase product. I purchased enough for my family and enough to share. One of the best things about this business is that you can do this from anywhere. We are in 34 countries right now and have just expanded to Japan! I have been doing this for over three years now. I don’t regret the decision one bit and I honestly wish I knew about this opportunity years ago. That is why I am sharing this with you now. This is a great way for a Stay At Home Dad (SAHD) or Stay At Home Mom (SAHM) to enjoy being home with the kids and still be able to bring home the bacon so to speak. With the new Affordable Care Act options, insurance can be purchased through the marketplace. There is no need to work for an employer. Now this opportunity could bring you in an extra $500 a month or it could bring you in $10,000 a week. It really is up to you and what you put into it. For me, I go about my business. If I am at the doctor, I share this at the doctors office, if I am at the grocery store, I share it there. If I am on vacation, I share it there. It does not get much easier than this, and did I forget to tell you? This is CHOCOLATE we are talking about!! Almost everyone I know loves chocolate. Thanks to the media there is almost constant attention regarding the health benefits of Dark Chocolate. Dr. Oz even had a few shows about the value of antioxidants recently and how they are so important to our health. Well this product is the highest antioxidant content of any food I have found. Just 3 little Belgian Chocolate power squares is 49,464 ORACfn Antioxidants verified by Brunswick Labs. That blows any other antioxidant products out of the water. And, every 3rd subscription for the first year, the company will send you another free product of your choice. I am looking for business minded individuals who are serious about this business opportunity. I am looking for Stay at Home Moms, Dads, Grandmas and Grandpas to join my team. Let me show you how you can succeed in this business and start earning the income and living the life you have always dreamed of. The one where you still have time for your family and all the things that are important to you! 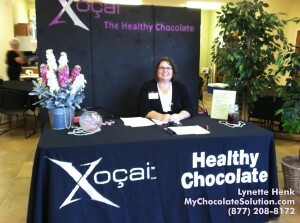 Call me at 941-216-5727 or go directly to the XO Healthy Chocolate Site to get started. PreviousHave You Heard About The Chocolate Diet Solution? NextGet Rid Of That Wax Sugar Filled Halloween Candy, Order Your Free Sample of Healthy Chocolate Now!